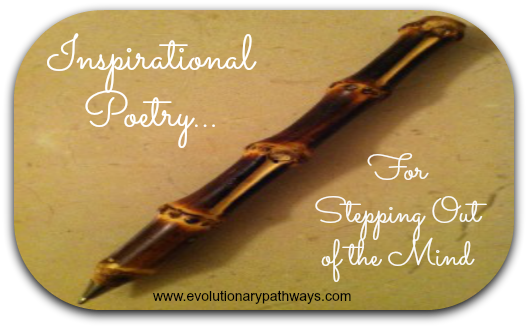 Inspiring poems for life remind us of the magic, strength and beauty of living. Taking a break from the mundane and reaching for the profound; we have a chance to step out of the mind and explore sacred ground. Enjoy these inspirational poems about life so profound. Inspirational poems about life help you and I connect with a magical, yet ordinary truth. Inspiration is what we find the very moment we step out of the mind. The mind is a logical, linear thinking machine. It sometimes has trouble handling the sheer variety of stimuli, changes and experiences that life brings our way. The mind is easily overwhelmed; and we get swept away. Stepping out of the mind is to regain control - ironically enough, by first letting go! Enjoy these inspirational poems about life. They invite you within - to take a momentary break from the strife. A quick note first on wisdom and the mind. Where is it exactly that wisdom resides - where can we expect it to find? Is the mind itself the repository where wisdom brews; or is the mind mainly filled with nuts, bolts and screws? Is there a connection between inspiration and wisdom as well? When you're inspired you know what to do, can't you tell? What better introduction to life and to the mind; than to start with a creativity poem to relax and unwind? Wisdom poems can be great for the soul too; or maybe a poem about freedom, fear or trust will just as well do. If it's motivation you've lost; this how to change my life motivation poem may bring back your truth at no cost. If it's happiness you seek; perhaps poems about happiness will be a great start to your week. On the other hand a forgiveness poem may actually be what you need; or a relationship poem to go ahead and plant a good seed. Poems of character & inner strength are mighty fine too; or a poem about courage - they are talking to you. A gratitude poem may itself do the trick; these motivation poems will help but be quick! Want to be inspired right down to the core? These self discovery poems can be downloaded to your computer and more!